Please do not place a request until you have funds in your ClassWish account. You will shop on the No Starch Press site to assemble an order, but you will not place your order with them. Rather, you will assemble the order and then email it to ClassWish for us to submit and pay for. Please follow these easy directions. If you want more supplies than your balance allows, you can make a tax-deductible contribution to your own wish list before or immediately after you shop. When you have donation funds to use (or are about to add your own funds), go to http://www.nostarch.com/. (To see other vendors for other categories, please go to the home page of this ClassWish-vendors site). Provide the information for this page. Please enter the same email address as you used to register with ClassWish.org. Provide the school name where they ask for 'Company' and the school address. We cannot ship to your home. Provide the school phone # in case of delivery problems. Click the box that says: "My billing information is the same as my delivery information." You will not be billed; this is just to let you get to the next step. Click the button that is labeled, "Click to calculate shipping." The website will calculate the shipping cost. You will be able to see your Order Total in this section. It is outlined in green in the image to the right. Only books being shipped to addresses in California will be charged sales tax. Do NOT provide your credit card information. 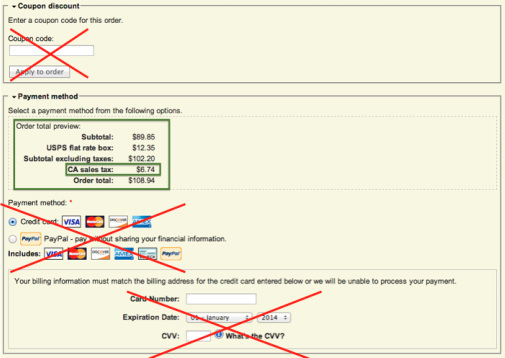 You are only using the No Starch Press site to assemble the order, not to place or pay for it. Do not exit out of this page. You will need to copy the shopping cart into the Request Form as described below. Look at No Starch Press's Checkout page, which you are still on. Highlight the cart contents of your Shopping Cart, as we show with the purple high-lighter in the image to the right (do not do a screen grab). 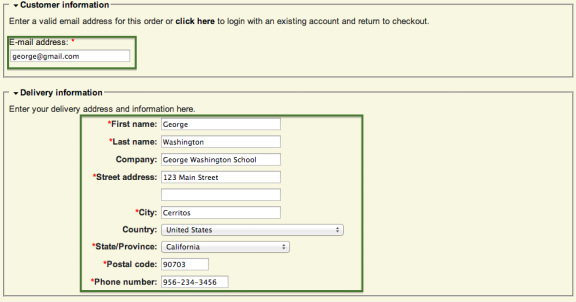 Copy and Paste the cart into the second page of the Request Form. Also, highlight the Order Total Preview which is under the Payment Method section. This will show us your Order Total, which includes the Shipping Cost and Sales Tax (if shipping to California). Copy and Paste this into the second page of the Request Form as well. Email the form to Request [AT] ClassWish [DOT] org. Remember, many companies match employees' donations. Be sure to apply if you or your spouse is eligible. ﻿So long as you have enough funds in your ClassWish account, we will deduct the order amount and pay No Starch Press. No Starch Press will ship the items to you at your school. Thank you very much for this opportunity to help! Have any questions? Just email us at Support [AT] ClassWish.org.